The South West of Australia is a beautiful blend of tall forests, beaches and wide open countryside. This discovery tour provides you with the best of all these elements, Taking you all the way down the coast to Albany, then inland to the Stirling Ranges and across country to the coastal town of Esperance. Enjoy! The ride down the coast to Esperance is an amazing experience that will take you through changing landscapes and past some amazing sights. This first leg to Bunbury might not be the most entertaining in terms of scenery, but there are some pleasant places to stop off and Bunbury is a charming centre that in tourist terms is best known for the friendly dolphins that often come to shore. If you want a break on the drive down then stop in at either Mandurah or Rockingham, both have picturesque beaches and would be a nice place to have a snack and a drink. After a night in Bunbury head on to Walpole, perched beautifully on the Walpole Inlet, where the Karri Forest reaches the ocean. As it is surrounded by National Park, there is plenty of exploring to be done here. 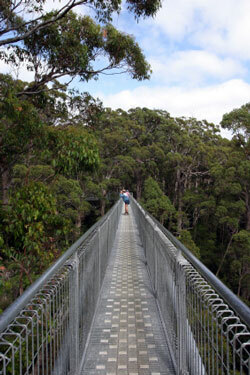 Nearby is the �Tree Top Walk�, the world's longest and highest tree-top walkway at over 600m long and up to 40m high. It offers a great perspective on the life of the forest. Beach lovers will want to visit Mandalay Beach, sweeping and white with dramatic rocky headlands, and of course there are the calm waters of the Walpole inlet that provide a great location for water based recreation. Albany is just a short distance away from Walpole, so this part of the journey should be about taking it slow and enjoying the scenery on the way. About halfway there you will pass through Denmark, a picturesque little town surrounded by hills and Karri Forest. It�s a place rich in history and deserving of a look. Albany is equally historical, having been a base for whalers in the past, a past that is recognised in the Albany Whale Museum. It is ironic that the animals which were once hunted here now often pass safely by close to shore, adored by spectators on the shoreline. Instead of continuing up the coast to Esperance, head north to the Stirling Ranges. These mystical mountains are home to some of the premier bushwalks in the whole country, and there are a number of camping grounds you can stay at. Bluff Knoll is the highest peak in the ranges, and as a result experiences a different climate to the rest of the region. Often in the winter its peak is dusted with snow- but be warned that the climate here can be very temperamental and is subject to sudden changes. In the spring carpets of wildflowers cover the mountain slopes, adding to the appeal of the Stirlings. From the Stirling Ranges you tie in again with the South Coast Highway that takes you east towards Esperance. This is the longest leg of your drive, but it will also be the most rewarding. Esperance, which lays claim to the whitest beaches in Australia, sits on the shores of Esperance Bay. From here you can visit the islands of the Recherche Archipelago (Woody Island being the most popular). Staying on the mainland there are three National Parks you can visit, Cape le Grand, Stokes and Cape Arid. Cape le Grand is definitely the most recommended. The town itself is a beautiful and friendly place, and you are sure to want to spend some time here before heading off back to Perth!